Centaurea calcitrapa suspension cultures were grown either in Erlenmeyer flasks or in a mechanically stirred bioreactor. Its rheological behaviour, when fitted to the Oswald–de Waele model (power law), showed pseudoplastic characteristics in both cases. The flow behaviour index (n) decreased over the course of a growth cycle and the consistency index (K) increased, reached a value of 1.81 N sn m−2 run on 2 l bioreactor. Bioreactor cultivation of C. calcitrapa cells at different agitation rates (30, 60, 100 and 250 rpm), highlighted the influence of shear forces on cell viability loss (90–34%) and phenol accumulation (74–140 μg l−1), due to increased stirring speeds. Analysis of these results suggests that this cell line is shear-sensitive. 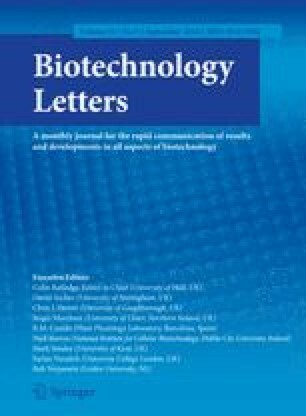 An empirical exponential correlation was defined between apparent viscosity and biomass concentration, under the studied conditions, giving the possibility to estimate the prevailing broth regime and to optimize bioreactor design.